Infidelity and temptation aren’t problems solely for the unsaved. This novel picks up after the restoration of a marriage that had dealt with these issues and sought out the help they needed to restore. 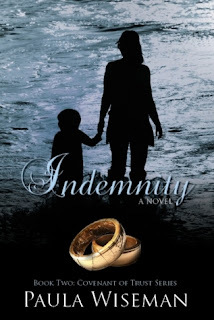 I did not read book one in the series, Indemnity is the second book in the Covenant of Trust series, but was able to get the gist of what happened in book one. I do recommend reading the first one though to give you better than a ‘gist’! Chuck and Bobbi have moved on and found comfort again in each other and God when Chuck’s sin is thrown back at them once again. The ‘other woman’ Tracy shows up in town with a 1st grader that resembles Chuck! Talk about being thrown back under the bus. I felt so sad for Bobbi who sees this child Jack. Lessons learned in the past in the positive are back in place as Chuck and Bobbi have friends come and counsel then, pray with them and give words of wisdom. I loved how they had such a network of help, but is seemed out of place to me not having read the first book. I thought it was strange to have Bobbi’s mother in law come and pray along with Bobbi’s sister, and a group of friends. I don’t know that many people have that network of love and support. Throughout the book though I felt that Chuck and Bobbi were certainly blessed by that community of Christians. There is so much depth to this story, and forgiveness with the aid of Christ. Love can conquer even those things we think will end the relationship. I loved reading the second one in the series I can’t wait to see what the third holds. This is a great contemporary series to read to see God’s grace modeled and how it can impact the lives of so many. I second that! Thanks so much, Melanie!